We would be most honoured to have you as a guest at the 60th edition of WAJO, marking 5 years of dance curation in Nigeria. It will be an evening of glitz, glamour, dance and celebration featuring special dance performances that will remind us of our culture, our history while pointing us towards a future. This event will have in attendance executives from branding and marketing companies, government officials, members of the diplomatic community, celebrities and dance enthusiasts. 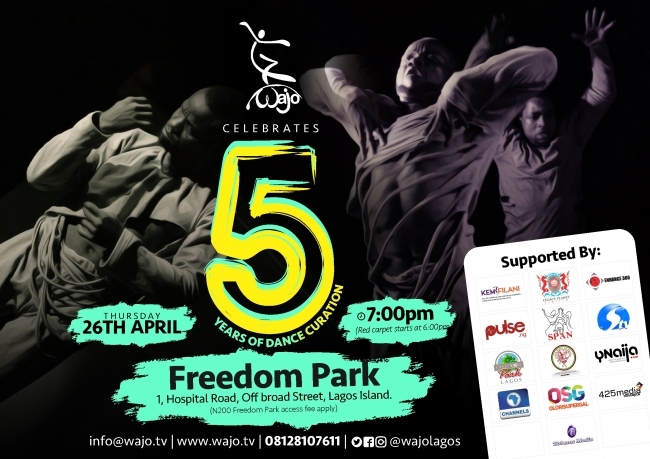 WAJO is an all-inclusive interactive monthly dance platform that features some of Nigeria’s finest dancers alongside dance lovers and enthusiasts from all works of life. Our vision is to make dance more prominent and relevant.Every last Thursday of the month since April 2013, people have gathered at the amphi-theatre of the iconic Freedom Park Lagos for what has been described by many as ‘simply amazing’. Proudly supported by @enhance360 @freedomparkng @channelstv @silverbirdtv @spanigeria @425media @ynaija @pulsenigeria247 @olorisupergal @kemifilaniblog @ekogond @legacyplanetltd @wazobiatvng @nothingtodoinlagos @brandregiment @tobemsmediaTelephone: +2348128107611 Email: media@wajo.tvFacebook: WajoLagosTwitter: @WajoLagosInstagram: @WajoLagosHashtag: #WajoLagos #WajoAt5We look forward to seeing you. Bullet Description: We would be most honoured to have you as a guest at the 60th edition of WAJO, marking 5 years of dance curation in Nigeria.